Scorpio Mythology, What is it about? Scorpio Mythology has an assortment of stories connected to it however, the constellation Orion figures in them all. 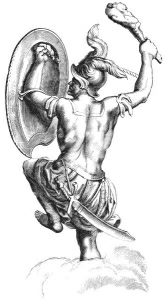 In this Scorpio Mythology legend, Orion the hunter, was a Grecian Goliath of a man, who wasn't only the most gorgeous man in the world, he was as enchanting as honey to women. In many translations, Apollo directed the scorpion to go after Orion. Apollo was envious of Artemis' attraction to Orion, not to mention defensive of his sister's virginity. Apollo helped Artemis (AKA- Selene/Luna/Diana/Hecate/Trivia) in placing Orion's constellation in the heavens. Apollo felt contrite and wanted to ease his guilty conscience. 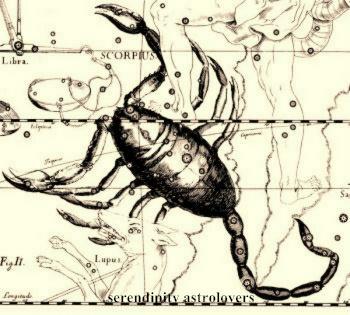 Even so, Scorpio was also put there, and like clockwork when Scorpius comes out in the night's sky, Orion begins to drop away to the opposite side, forever hightailing it away from the scorpion. In yet another Scorpio Mythology version, Artemis kills Orion by mistake. Eos, (Greek the goddess of dawn) liked to amass notches on her headboard of good-looking young bucks she conquered. Eos invited Orion to her bed, and he happily consented. While hanging out with Eos, Orion tooted his horn bragging how he was the greatest hunter and could kill all of the savage creatures that ever walked. Apollo, who's duty was to defend animals, was swayed by Gaia/Gaea/Ge (Goddess of Earth AKA Hera), to send off a gargantuan scorpion with thick skin to bite the Hunter to death. Orion attempted to elude the scorpion by going into the sea. Artemis was in love with Orion and wanted to save him so she discharged her arrow trying to shoot down the scorpion that was going after Orion. Artemis was a brilliant shooter and hit something black that was bobbing up and down in the sea. The tragic irony was, instead of killing the scorpion, Artemis shot Orion and he died in a flash. 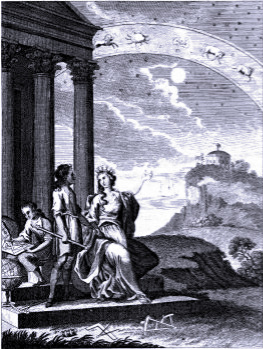 Afterward, the lovelorn Artemis committed Orion to the heavens as a constellation. There the gargantuan Scorpius, tracks Orion forevermore. In another variant of the Scorpio Mythology, Artemis herself dispatched the scorpion to do away with Orion. The grounds for this alteration changes according to the myth involved.Some myths tell of Artemis being furious because Orion got the better of her. In some Scorpio Mythology versions, Artemis sent Scorpio to assassinate Orion because he bragged about how good he was at killing animals for fun (Artemis believed in hunting only for food). Orion had gone to Krete or (Crete) to hunt and pass time with Artemis and (her mother) Leto. While there, Orion started talking of exterminating every creature on earth. Artemis and Leto charged a venomous scorpion of great size to bite and eliminate Orion. Orion and the scorpion had a great battle, even Zeus took notice of it. After the fight, Zeus raised the scorpion to the heavens as a commemoration of what had happened. At Leto's and Artemis' urging and also for being virile, Zeus put Orion among the stars too. Orion is up there to function as a record of what can happen when humans don't learn to moderate their undue pride and swelled heads. In another interpretation of “Scorpio being sent to abolish Orion by Artemis“. After a casual encounter, Orion fell in lust and started chasing the Pleiades or the Seven Sisters : (Maia, Electra, Alcyone, Taygete, Asterope, Celaeno and Merope) along with their mother all over the Earth. The parents of the Seven Sisters were Atlas - a giant and Pleione- the Oceanid. There is yet another conflicting Scorpio Mythology legend that involves the Pleiades. In this version, the Pleiades were pure and virtuous friends of Artemis. While hunting a deer, Orion snuck up and interrupted the sisters. The girls took off horrified. Orion's passions were flared by their ravishing elegance. Orion chased them persistently; he was a hunter after all. Overwhelmed by this, Artemis begged Zeus to step in. Zeus was ironic, but he did help. As Orion caught up with the girls, Zeus changed the sisters into doves and they flew away from Orion. Here lies the irony, Zeus not only saved the Sisters from Orion he took them away from Artemis too. Artemis was infuriated by this double diss and she retaliated against Orion. Artemis went to her brother Apollo, who had been insulted by Orion's hunting skills (a mere human). Artemis convinced Apollo to put the atrocious scorpion on Orion's trail. Zeus would not be bested so easily, in a show of his grim humour, Zeus set Orion in the skies in a futile chase of the Pleiades for infinity. The Scorpion is also up there tailing Orion for all time. Even in being sarcastic Zeus had pity for his girl (Artemis- the Moon Goddess), the path of the Moon in the sky goes by the Pleiades. Therefore, Artemis would have comfort in being reunited with her friends repeatedly. No matter what Scorpio Mythology version you like, the never-ending "chase and kill" part of Orion's life and death play out repeatedly. Orion is opposite Scorpius in the sky, so as the scorpion arrives on the scene, Orion "dies" by dropping out of sight. While Orion and the scorpion are united forever in these tales, the constellation of Orion is always on the polar opposite side to where ever Scorpio the Scorpion is. The proposition that the two remain apart serves as a caveat to preclude any renewal of the feud. So in the end Scorpio and Orion are located nearly 180° away from one another to avert problems. *Scorpio is among the earliest of zodiac signs. *In the beginning, Scorpio heralded the coming of fall to the ancient Mesopotamia. Scorpio’s name derives from the Latin (Scorpio the Scorpion), translated to the Greek (Skorpios), translated to the Akkadian (Agrabu the Scorpion), translated to the Sumerian (Gir.u.tab the Stinger). Want a Scorpio astrology sign to be attracted to you?